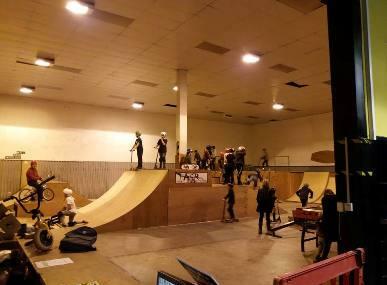 The Tasr Indoor Skatepark is a fabulous skating arena where the top-quality equipment and the immaculate facility will let the skating enthusiasts practice their skills as well as learn from the efficient professionals. The interior lighting has a sepia effect to make the experience worthwhile. The immaculate and spacious facility is equipped with curved ramps, rails, stairs and bends. There is a retail shop at Tasr Indoor Skatepark from where you can rent the BMX Bikes, scooters, helmets, skateboards and skating shoes. You can also bring your own gear here to enjoy skating. If you are not feeling like skating or have finished your session, you can sit back at the pavilion to watch others or grab some snacks from the concession stand. Great fun. Friendly staff. Food and drink is reasonably priced too. Highly recommended. Just remember to take a coat in winter if you are going to be sitting around waiting for kids; it gets cold! Top quality facility. Staff are really helpful and friendly. Food is top knotch and reasonable prices and they also have their own retail shop selling scooters, skateboards and parts. Great value for money. Good all round family oriented place.